The first Fourth-of-July fireworks I remember were not really fireworks at all, but hand-powered spin-sparkler toys. These consisted of a thumb plunger connected to a small wheel with a flint; when the plunger was pressed, very tiny sparks shot out. Although tiring for small hands, these spin-sparklers were safe even for toddlers. 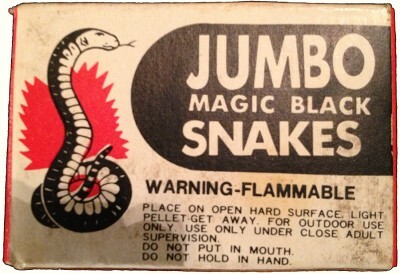 Aside from these and "real" sparklers, fireworks were illegal in our small town. Later, after we moved to Oklahoma, my brother and I got to pick out our own fireworks (which were legal, although only for the few days leading up to the Fourth). Near the end of June, a fireworks stand would open on a vacant lot near the grocery store; behind the wooden counter would be shelves and shelves of fireworks, some familiar, some whose attributes had to be puzzled out from tantalizing labels. My brother and I could each buy ten dollars' worth, so they had to be weighed and chosen carefully. There were day-time fireworks: parachute flares with tiny American flags, and "magic black snakes" (viewed with some disdain by the boys, since they didn't actually blow up), and once a little spinning whirligig that shot out colored stars. There were "red rats" and "whistling chasers", whose main claim to fame was that they were mobile (and in an unpredictable way); when placed on a hard, flat surface like a patio, they whizzed around erratically before exploding – preferably near the foot of an unwary adult who hadn't been vigilant enough to track their progress. "Whistling chasers" made a noise in the process; "red rats" didn't, or at least not as far as I can recall. After dark, the night-time fireworks took over; fountains and pinwheels and roman candles, which were handled by my Dad and which always seemed to emit either more or fewer shots than specified on the label. And sparklers, of course — although the received wisdom was that these could reach temperatures "as hot as the surface of the sun", which makes one wonder why they were considered safe for very small children. Usually, the first few sporadic firecrackers could be heard at about 11:00 or noon. The detonations would pick up pace slowly, reaching a crescendo near twilight. All through the hot afternoon, the distinctive smells of Independence Day rose and blended — the sharp sulfurous tang of fireworks, the mellower smoke of back-yard barbeques, and an array of food aromas that must have had all the dogs in the neighborhood drooling. Our own Fourth of July menu varied somewhat from year to year, but within a fairly narrow range — sometimes hamburgers and hot dogs, sometimes fried chicken. There were the creamy salads I didn't like – cole slaw, potato salad, macaroni salad — and the corn I insisted on slicing from the cob. There were cakes, and chocolate-chip cookies, and watermelon, with its odd texture halfway between sherbet and Styrofoam. But always and best, there were my Mom's baked beans — stiff and sweet with molasses and brown sugar, savory with onion and a touch of dry mustard, and cooked with bacon on top. These could be eaten hot or cold; leftovers could be made into baked-bean sandwiches by those who liked such things. Sometimes, after eating, we'd drive to the parking lot of a nearby school and watch a local fireworks display from folding lawn chairs or from the hood of the car, leaving our own night-time fireworks for afterwards. If municipal fireworks shows were synchronized to the radio back then, I don't remember it, but the "1812 Overture" with its cannon finale always plays as background music in my memories of the Fourth. Once, I remember, we watched a Washington, D.C. fireworks display on television; that's when I learned that fireworks lose something when viewed on screen rather than in person. Much as we kids enjoyed the holiday, the thrills of Independence Day were lost on one member of our family. This was not my Mom (although a few close encounters had taught her to loathe "red rats"), but our dog, McDuff. Despite a bird-dog heritage on both sides, McDuff was terrified of loud noises — gunshots, thunder, and fireworks. If not tranquilized for the occasion, he sought refuge by hiding in spots much too small to accommodate a large dog — under the wall-to-wall carpet, for instance. The dog aside, though, fireworks struck us as a distinctly harmless amusement. Sure, there were loud noises, near misses, dire warnings from parents, calls to the police. But no one we knew ever got hurt. At age 16, though, I got a more sobering view of personal fireworks. I was in Boston over Independence Day, staying on the seventh floor of a high-rise dormitory. I couldn't see the big municipal fireworks display from my room, but as night fell, I began to see the familiar arc and sparkle of bottle rockets (illegal there, I believe) going up. At first, I felt cheered by the reminder of what was going on back in my own neighborhood. Then I saw a clump of flame that was too low and too large to be a bottle rocket. Over the next 45 minutes, I watched several other fires blossom here and there around the city, and I heard the near-continuous wail of sirens. That night gave me my first inkling that fireworks (like love and other thrills) can sometimes be taken too lightly.